VanVleet Woodworking LLC is Live! VanVleet Woodworking LLC is Here! This blog will be moving. If you are a regular reader, or just stumbled by, please check us out at our new website and location. Happy New Year to one and all. 2016 was a zinger of a year and makes me look forward to 2017. For me, 2017 may be the year of change with some announcements coming in the near future. But, for now, 2017 is kicking off with a new project - an entertainment center. 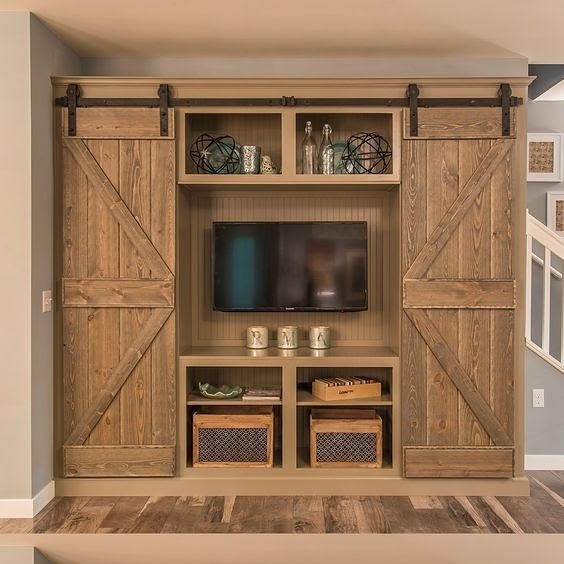 This entertainment center is for a family member who has a large living room. They are in the market for a new TV, but with two smaller children, wanted a plan that would potentially "protect" the TV from flying objects. The idea is to have two tall bookcases on each end, with a TV section in the middle. 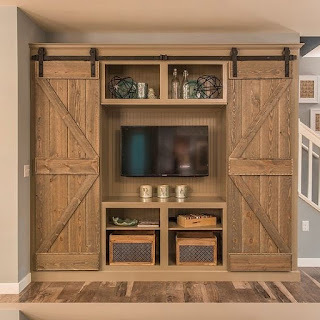 There will then be two barn doors that will slide out to the sides, or together in the middle. When in the middle, they will cover the TV, when on the outsides, the TV is exposed and bookcases covered. 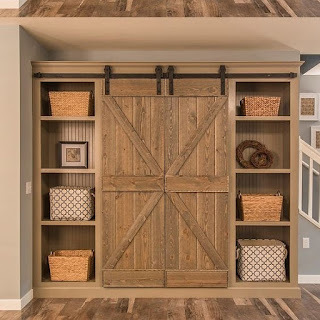 Here are a couple pictures, from Pinterest, of the design idea. It is here that I will jump in and say, this project is a beast! It is scheduled to be about 9' wide, by just under 7' tall. It will be built in 3 parts; the two end bookcases and the center cabinet. This is so that it can get in the door and then be taken apart in the future. The trick with this design is, how to attach the upper and lower trim pieces once the full pieces is assembled in order to make it look uniform, and not like 3 separate pieces. I'm taking submissions on ideas for that! So, as a general rule, I do not use plywood on my projects....as a rule. But there are exceptions to rules which then define the rule, and this project is one of those exceptions. I am using plywood for the case work for two reasons. First, it would be way too costly to try and build the cases out of solid wood. Second, the piece is going to be painted so using solid wood would be a waste of resources. As I mentioned before, this piece is huge so I think plywood is the best choice for the cases. 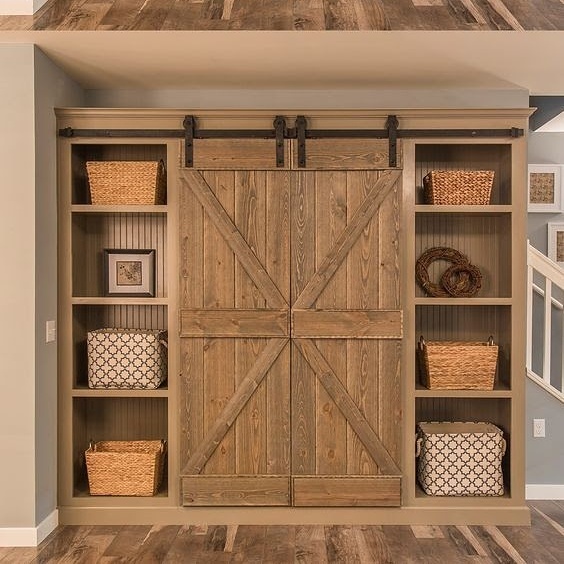 The trim, backs, trim and doors will all be solid pine, for that more rustic look. This project starts with breaking down the plywood sheets to their rough dimensions for final dimensioning on the table saw. I break down the plywood with a recently purchased track saw. 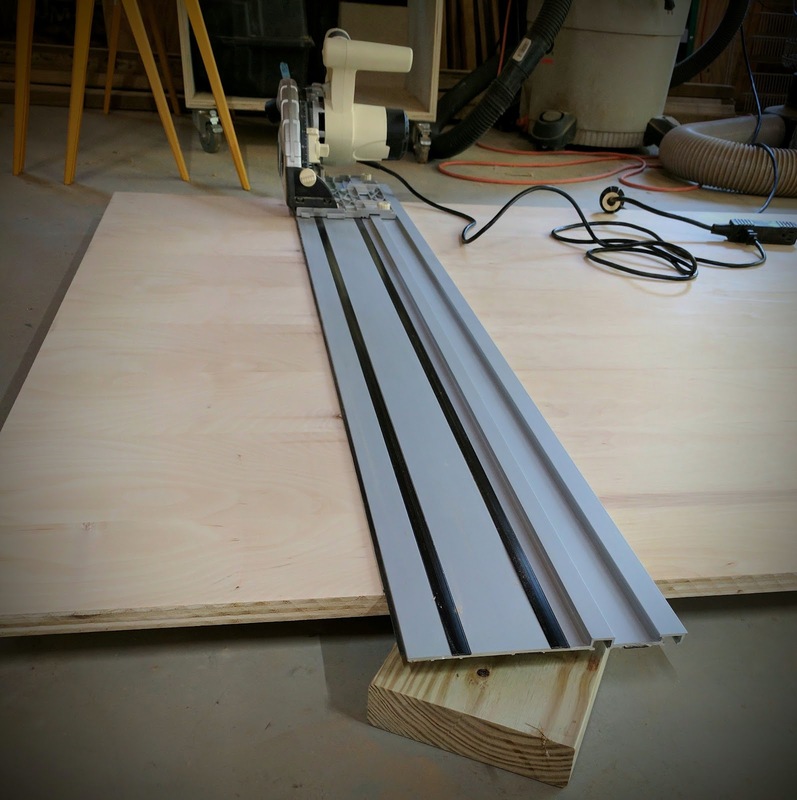 (Side Note: if you do a lot of work with plywood, or large pieces such as table tops, do yourself a favor and invest in a track saw!) The track saw I have is a Shop Fox version, which works well after some tuning. Once the pieces are in their final dimensions, I laid out the lines where I wanted the shelves to go. Then, I clamped the left and right pieces together. What you do here is put the pieces together, with the insides faces against each other, and open them like a book, so you have a perfect matching set. 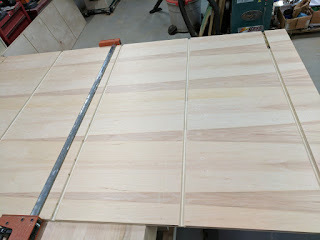 Next, I used a straight edge guide and a router, with a plywood bit, to route out the grooves that the shelves will go into; I'm cutting to a depth of roughly 3/8" or just under. Once these grooves are routed, I move to the table saw to cut a dado in the back edge to receive the ship lap panels that will form the back. This dado is inset about a half inch from the back and is 3/8" in width, and depth. Once all the grooves and dados are cut, there is a bit of a tedious process that needs to happen. I picked up this trick from Tommy MacDonald a number of years ago. Use your router plane to go back over all your dados to ensure a uniform depth of cut. Plywood tends to have some dips and crowns in it and when routing or using a dado to cut your grooves, it may not result in a uniform depth of cut across the surface, which results in panels not fitting properly. As I mentioned, this is tedious, but the end result is perfect. In the next part of the build, I will work on assembling the cases and fitting the ship lap boards in the back and the trim in the front. If I haven't said it before, I'll say it again; this thing is a BEAST! 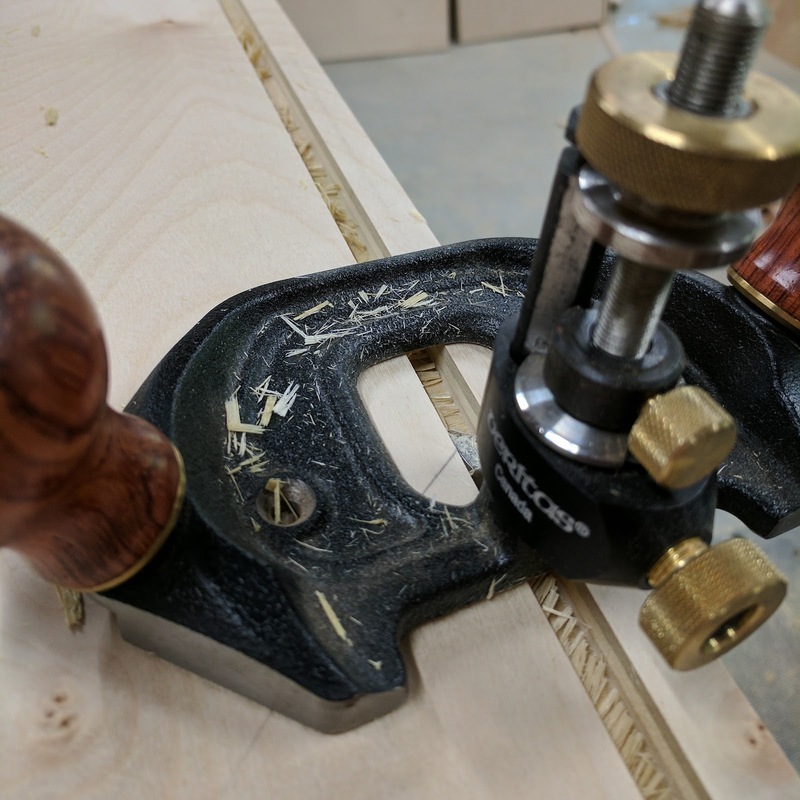 Happy woodworking and stay safe!